allasFCB: Why center backs should often ignore making passes to full backs. I've always been a huge proponent of salir jugando, a way out, a solution, to to play out from the back. Ricardo La Volpe was the early exploiter of this and brought Pep Guardiola's attention to this when he took his coaching courses. Pep brought this to Barca with him and then it took off, now almost every team in the world uses it, more or less. Goalkeepers train with their feet now just as much with their hands. But I also believe that there are only a few teams in the world who use this properly and actually get an advantage from it. Barca have always been one. Pep's teams are another. Sarri's Napoli and maybe a few others. But not much. Others use it just for the sake of it. Let me explain. There are two instances where Barca's center back clearly ignore an open pass to their full back, which any other CB in the world would make with eyes closed. But the reason why it's not the case in Barca is that they already see the next play in their head. They play it to FB, who's back to the goal and as soon as he would receive it he'd be under pressure and has very little options to play it forward. That's why the CB's ignore them. They already see the next play and that pass would put them under pressure. That's why they go back to the keeper and that opens up the play for them again. They make the field as big as possible. Using all 11 players to make correct spacing between them. Not to close, not to far from each other. Once Ter Stegen plays it to Alba it breaks the first line of pressing and opens up a whole load of pitch up front and they could attack the goal. That would never happen when you play lateral passes to your full backs who'd become under pressure right away, even if it first seems they are open. Here's an example of Spurs against Manchester City from their last game. They only play laterally and don't use their midfield. There's basically only one midfielder on sight. Once City sees that they even force them to play laterally, towards their left flank and then put them under pressure immediately and Spurs loses the ball. Here you can see clearly that the touchline IS the best defender in the world. It does half the work for you. It limits the options. Spurs uses to build from the back using their wings and it's only a trap when you have a team like City facing you. City plays it out from the back. Ederson to Laporte. He has a clear path to his full back Mendy. Would a Spurs center back make that pass? Absolutely. But what does Laporte do? He sees Mendy. But he also sees that it would put him under pressure and limits his options with the ball. So ho does what we call 'la pausa' a slight pause. That opens up an option for him to play a pass into midfield to Silva, who acts as a 3rd man here. He's the solution. You should always use your midfielders. So Laporte plays it to Silva who them plays it to Mendy with one pass and then right away runs into open space forward for another option. That opens the game up for City. Would that be the case had Laporte played it to Mendy? Absolutely not. That's why center backs should always look for their midfielders and not full backs. They're the solution. Full backs are puns, that you could move around the board and use when needed. But you must play through your midfielders, they are the solutions, they are the keys that open up the play in football. I think this is a great observation and worthy of discussion. But in the last video it seems like Mendy could have received the ball without being under pressure. 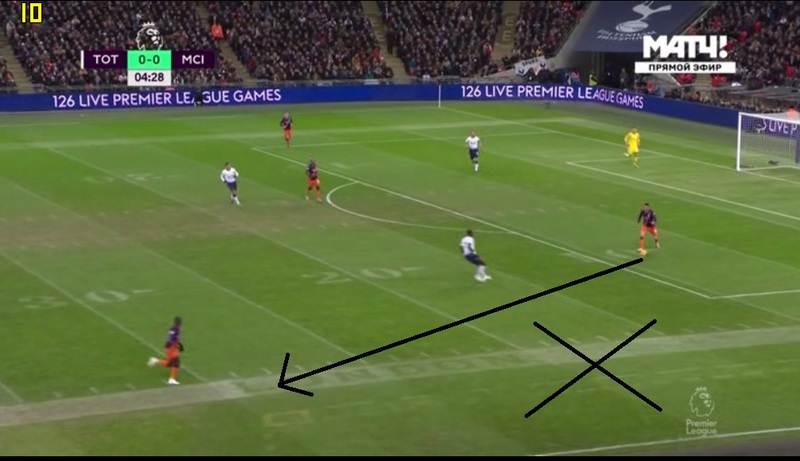 Maybe Laporte thought the Tottenham player was closing the passing angle too quickly or playing centrally then wide would give Mendy more time on the ball?